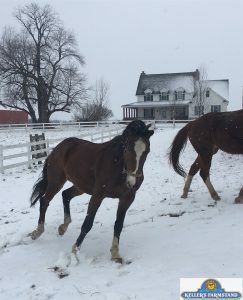 Our pony, Blue, and our horses, Charlie and Trace, LOVE the snow! Their body language displays obvious enjoyment. Frolicking in the snow and snacking on hay make for a great morning! Want to see a video of them playing in the snow? Click on the YouTube, Facebook, Instagram, or Twitter icon on our homepage!